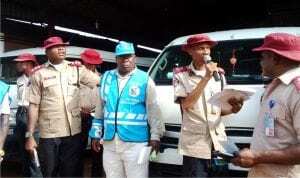 Deputy Corps Commander, Federal Road Safety Corps(FRSC), Edo State Sector Command, Mr Obisike Uchendu (2nd right) and other officers enlightening motorists on the dangers of over speeding, during the Annual West Africa Road Safety Organisation Day in Benin, recently. Harcourt have expressed delight with the availability of Premium Motor Spirit (PMS), otherwise called petrol but decried the recent increase from N86.50 per litre to N145 pump price. 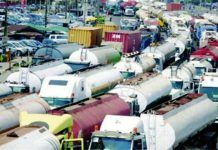 The motorists who expressed their views to The Tide in an interview said they were happy that most filling stations in the state have products and started selling to the motoring public as soon as the Federal Government announced the removal of petrol subsidy and increase in litre price of the commodity. According to them, the government came up with its decision at a very wrong time when motorists are still facing the hardship they face in purchasing fuel at filling stations and black markets. They supported any action by the Nigeria Labour Congress (NLC), the Trade Union Congress (TUC) and other civil society organisations to further press home the feelings of the workers and the public. Mr Obadiah Olu, in his opinion said the Federal Government should rescind its decision because increasing the fuel pump price at this period is not in the best interest of the masses, stressing that they should consider the plight of the people that voted them into power. Also, a social crusader, Amina Okonte, in his reaction bemoaned the federal government’s insensitivity, adding that with the biting economic situation of the country and it effect on the masses, coupled with the recent fuel scarcity that sent most motorists off the road, the government should take a second look or the organized labour and others should take a firm stand as to call the government to order. In his own opinion, Akeem Oshodi opined that the government should have first dialogued and informed the masses before the increase, pointing out that it is the highest act of impunity. A commercial driver, Nsikak John was of the opinion that an enforcement team should be set up to deal with all filling station owners that have been hoarding the product, only to open for business after the pump price increase by the Federal Government, saying it is an act of sabotage and economic fraud to the nation and the masses, especially motorists.